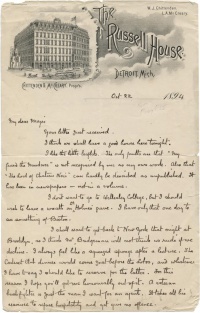 This letter was written by Arthur Conan Doyle on 11 july 1894 to Major James B. Pond from The Russell House, Detroit, Michigan, USA. 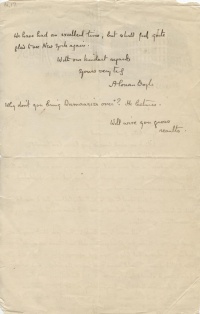 Conan Doyle suggests changes to the printed program for his lectures and comments on his upcoming itinerary. I think we shall have a good house here tonight. I like the little leaflets. The only faults are that "My Friend the Murderer" is not recognised by one as my own work. Also that "The Lord of Chateau Noir" can hardly be described as unpublished. It has been in newspapers — not in a volume. I don't want to go to Wellesley College, but I should wish to leave a wreath on Dr. Holmes' grave. I have only that one day to see something of Boston. I shall want to get back to New York that night at Brooklyn, so I think Mr. Bridgeman will not think us rude if we decline. I always feel like a squeezed sponge after a lecture. The Carteret Club dinner would come just before the Lotos , and whatever I have to say I should like to reserve for the latter. For this reason I hope you'll get me honourably out of it. A veteran bush fighter is just the man I want for an agent. It takes all his resource to refuse hospitality and yet give no offence. We have had an excellent time, but shall feel quite glad to see New York again. Why don't you bring Dumaurier over? He lectures. Will wire you gross results. This page was last edited on 9 November 2017, at 23:44.